Posted in: BSU Journal Club. Tagged: aliens. A fascinating study published last week out of Harvard CfA exploring the possibility that mysterious astronomical radio signals are actually alien spotlights used to accelerate enormous ships sailing on photonic winds. Since 2007, astronomers have observed about 20 events involving highly energetic bursts of radio waves, either live or in archival data, called fast radio bursts or FRBs. These bursts lasted for only milliseconds. (For reference, it takes a few hundred milliseconds to blink your eye.) In some cases, the bursts were isolated incidents; in others, they consisted of a few bursts separated by seconds or days. FRB signatures suggest they originate billions of lightyears away, somewhere outside our galaxy. Given these large distances and the fact that we can see them, the radio bursts must come from some enormously powerful source. Explanations for FRBs range from merging black holes or neutron stars to hyperflares from stars with magnetic fields so strong they would blank out the magnetic strip on your credit card at the distance of the Moon. However, as with most strange happenings in astronomy, the most exciting but controversial explanation involves aliens. In their recent paper, Drs. Lingam and Loeb of Harvard suggest that FRBs are actually beams from enormous alien spotlights used to accelerate football-field-sized spaceships sailing on immense light sails. This idea isn’t as crazy as it sounds. There have been several recent stories about using light sails and lasers to explore the solar system or even other planetary systems. Lingam and Loeb combine simple but compelling energetic and engineering constraints to explain the mysterious FRBs using their alien spotlight hypothesis. Why do FRBs appear and disappear quickly? The spotlights are fixed to the surface of a spinning planet and rotate in and out of view. How big and powerful would these spotlights have to be for us to see them from Earth? A little bigger than the Earth and about as bright as the Sun. Such a bright spotlight would probably be very hot, and so to keep it from melting, the aliens would probably have to make it very big to spread out the heat. How big would the spotlights have to be not melt from their own heat? Also a little bigger than the Earth. So, of course, the idea is still highly speculative, but different aspects seem to hang together, forming a coherent picture. Given how frequently FRBs have been seen, Lingam and Lobe estimate there could be something like 10,000 FRB-producing civilizations in a galaxy similar to our own, roughly consistent with some estimates using the Drake Equation. 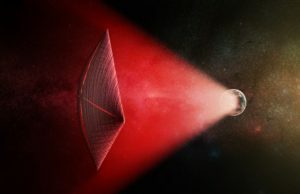 The authors even suggest we could test their idea that these spotlights are used to accelerate alien sailing ships by looking for the subtle telltales of shadows cast the ships’ sails in the FRBs.